Thanks for your recent comments about my sketches. Here’s a few more. I’m also testing out various ways to include photo slide shows into my blog. This is using Cinopa. Hope it works! I had a nice long weekend with friends in Palm Springs and took a watercolor kit to a wonderful spot, Indian Canyons. It’s just so much easier to travel with, than oils. I need a lot more experience with this medium to paint something I’ll be happy with. I think I’ll take a watercolor workshop. If you know if free resources on YouTube, blogs, or elsewhere-or can recommend an instructor–let me know. 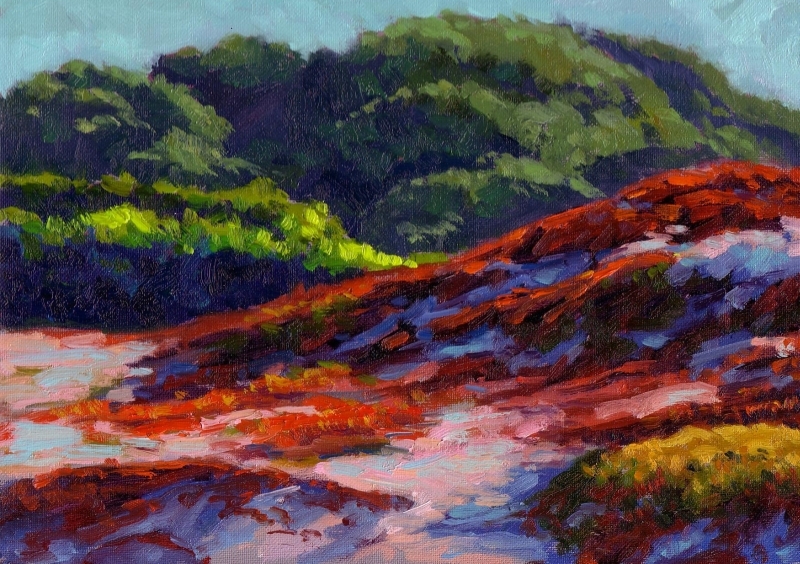 Some things I’m struggling with: layers, and how the paint interacts and changes color as you layer; Values, i seem to have much less control of value than oil. It makes sense that the medium (since it’s transparent) has less of a value range, but it’s still something I’m struggling with. Hope you enjoy this so-so result! I’m in Palm Springs for a long weekend painting watercolors. Nothing worth posting yet, but here are some pen/ink sketches of Gracie. The Golden Gate Park Bank has started their concerts again (running through October) every Sunday. As I’m starting to paint the figure again a bit more, I road my bike down to the park to complete some plein air sketch studies. 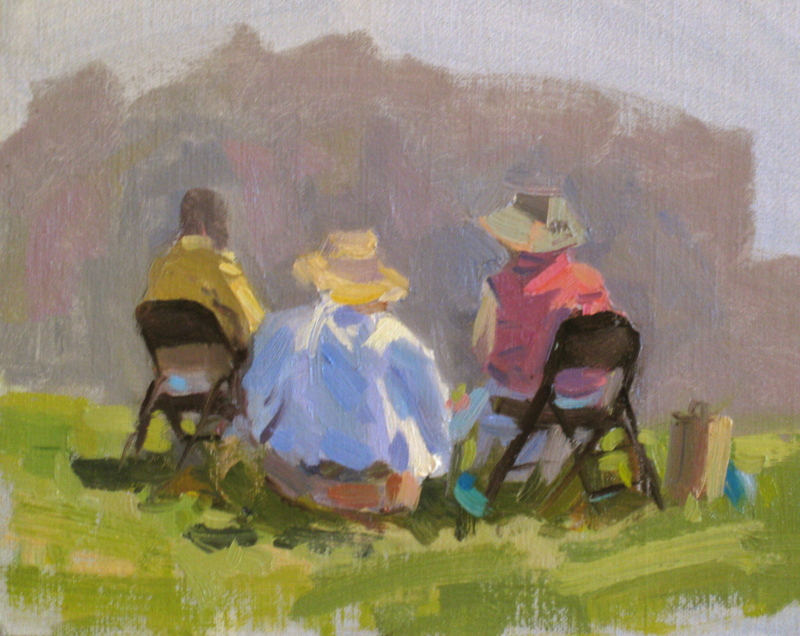 I’m studying with Peggi Kroll-Roberts in September at l’Atelier aux Couleurs in Petaluma this September (and John Ebersberger in July), and I hear that she directs students to do quickly plein air sketches of people as an exercise. I’m used to sketching people with pen/ink outdoors, but it’s pretty challenging in oil. I had a good time doing it. This was actually a big group, about a dozen people, but I started with one person and kept working outward to the surrounding people until I left. While I was in NYC last week on business, I brought a simple pen and ink set. I draw using a fountain pen with Roting-Brown ink, and a watercolor brush with water to create the wash. I like to sketch people (for some reason, landscape less so). Parks are a good spot. People tend to sit a while, or even sleep, as one of my sketches show. There was also a parade that Monday (Columbus Day), so I was able to capture the crowd. When I travel without my paint, I get figidity. What to do? I just got back from 4 days in Lincoln, Nebraska for my nephew’s high school graduation. It was a great trip. In between events, I’d go for walks (wherever I was), sit down and sketch a bit. They say you should always carry a sketchbook, but I usually forget. Remembering that the purpose of ad-hoc sketching is to better your skills, does it matter what you sketch on, or what you sketch? Hey I may not be the “Master of Blight” (William Wray), but I can learn from sketching anything, including a trash can. BTW, Katherine Tyrrell’s blog, “Travels with a Sketchbook” provides some great examples and discusses technique. Here are a couple of quick sketches of downtown Lincoln. And here’s Mike and I with our nephew Nick Cruickshank. Congrats, Nick! Just back from Chicago tonight, had a great time. Weather was perfect. The days before we arrived were unbearable, high heat, high humidity. We suffered some rain, but other than that, great weather. We lucked out! I was inspired by Katherine Tryrell’s recent travel sketches to do some of my own. I rarely use watercolor, but that’s the best travel medium, so I took a small kit with me to sketch with. Of the several I did, these are the ones I’m most comfortable sharing. I’m really an oil painter, so whenever I paint in watercolor it’s like a new world. Mike (my partner of 17+ years now) finished the Gay Games marathon in 4 hours, 21 minutes and 23 seconds. Plenty of time to sketch! I did these quick sketches on a small pad while others waited. I’m really proud of him. Imagine running 26.2 miles, without stopping over 4+ hours? And to think I occassionally participate in a day long “drawing marathon”. No comparison. Here’s another page from my sketchbook. This was done in the small village of Aurel, France. 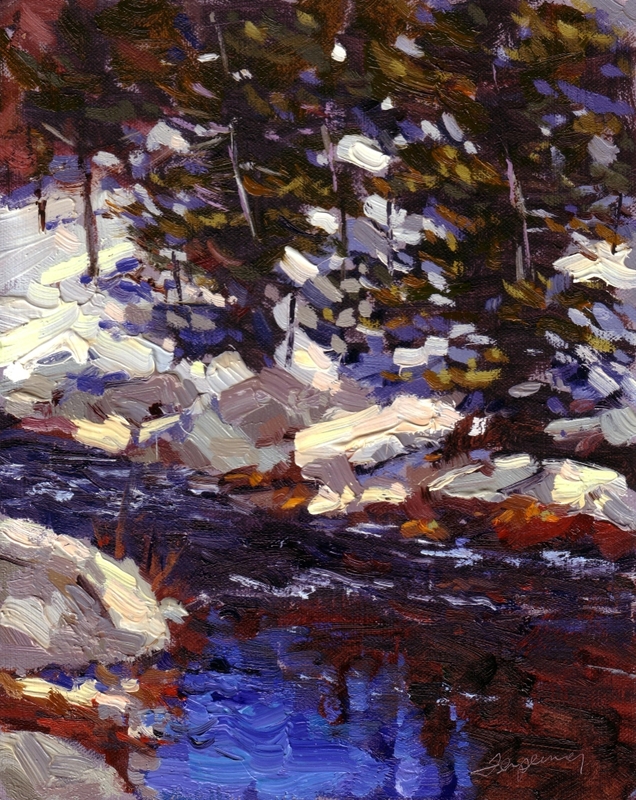 I took in the scene, and looked for a combination of shapes and values that lead my eye. The arrow drawing on the right is the desired eye path, and the end point, which I assumed to be in the window of the lower-right. A center of interest that is centered on thirds (top-third, lower-third, both vertical and horozontal). In the bottom drawing I drew the composition and kept notes on the scene. It was really striking. This is something I can take back to the studio and paint.